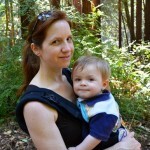 This is a joint giveaway from the Natural Parents Network and Embrita Blogging. Please find the section marked “Win it!” for the mandatory entry and optional bonus entries. Born at Home Toys is offering our readers a giveaway of their Happy on the Farm animal set, a value of $28 US. Born at Home Toys is a family owned toy workshop creating natural wooden toys for your little ones. We received one of their adorable Happy on the Farm Animal Sets, and my two year old LOVES them. They’re the perfect size to fit in his little hands, and their simple shapes and minimal detailing make them easy to handle and identify. I like them because they’re 99% toys – 99% of the play comes from my son’s imagination. Right now, he’s still learning which animals are which and which ones make which sounds, which these toys are great for. But in a few years, he’ll be able to use them in any way he deems fit for whatever scenario he’s acting out. Born at Home toys is local to Northwest Arkansas, if you’re in the area, and available at their Etsy shop if you’re not. They offer a variety of little wooden toys: animals and cars, and have recently added the Gro Tower to their lineup. These little animals would be equally at home in a discovery basket or a homeschooler’s farm set – you won’t be disappointed. For your own chance to win a Happy on the Farm animal set from Born at Home Toys, enter by leaving a comment and using our new Rafflecopter system below. The winner will receive one Happy on the Farm set. Contest is open WORLDWIDE. MANDATORY ENTRY: Visit Born at Home Toys and tell us one thing you have learned about the company! You must enter your name and email address in the Rafflecopter entry system for your entry to count, after leaving a comment on this blog post. Contest closes 4/14 at 11:59 p.m. Eastern Time. AUTHOR BIO: Emily writes at Embrita Blogging and spends more time playing with her son Sebastian than she does working on her in-progress novel, but since children are only small once, she’s willing to let everything else slide. Her interests are baking, rock climbing, interior design, photography, homeschooling and mindful parenting. Born at Home Toys uses “local, sustainable and upcycled wood, natural fabrics, and non-toxic glues, finishes and paints” — sounds wonderful! Thanks for the giveaway! I also love their Cherry Tree Village Vehicle Set. My DS would get a kick out of them. They make what appears to be a very nice Lavender Beeswax wood polish – I would love to try it! I love the Gro Tower! My daughter would love the Happy on the Farm set – she loves making animal sounds! I learned that Born At Home Toys is a family toy workshop. 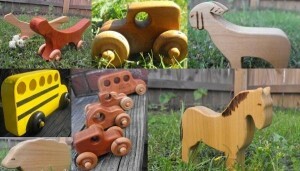 They make natural, wooden toys that are gender-neutral and heirloom-quality, using hardwoods and other natural materials. My little 4 year old daughter will enjoy your new Happy on the Farm set!!! I learned all their toys are gender neutral. That is awfully convenient! I love the set of wooden cars and trucks. My three sons and one daughter would be the ones enjoying this set. Ages 7, 5, 3, and 18 months. They use non toxic glue. Both of my sons would love these. The toys are not gender specific. I love the happy yellow bus. My 12-month old daughter loves animals! I love that this is a family owned business. Exactly the type of shop I want to support! ohmygosh, the little goat just kills me. so clever and cute!